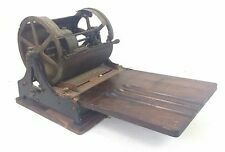 THIS IS A WONDERFUL ANTIQUE SMALL TABLE TOP CAST IRON BALTIMORE PRINTING PRESS / LETTERPRESS. THIS IS THE FULTON MODEL MADE BY THE BAUMGARTEN COOF BALTIMORE MD. IMPORTANT SPRING ON HANDLE IN GREAT WORKING CONDITION. Style: Flatbed. Manufacturer: Royal. All the keys & functions are fully responsive. Model: Number 5 Standard. Doing that is against U.S. and international laws. 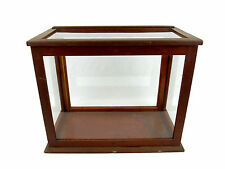 Antique Rexall Counter Top Pen Display Case. Shipped with USPS Priority Mail. Nice lettering has original green velvet lined drawer. Has some scratches and unfortunately the key is missing and some of one of the feet on the bottom is missing as seen in pictures. I do not know a lot about the history of this item, I have not been able to find another quite like it. It is 9” deep, 16 1/2” wide, 4 1/2 “ tall. Sold as is. The clearing knob will not clear all columns. All four screws on the front are loose and partly unscrewed. This adder never had a built-in desk stand like later models; there are no holes to attach either the wire bail or folding arm style stand. Up for sale is a very old 19th century cast iron strongbox. A real piece of history! Excellent for securing a firearm, jewelry, coins, bullion, etc. The handles are solid. My last picture does show a small piece of breakout on one lid pin holder, but does not affect lid function. As you can see,there is a lot of stuff here. This is a lot of 3 sizes, 18pt, and 2 smaller sizes on down, I think 14pt and 12pt. This all that was in the printer's job case (tray) as it was left years ago. This lot includes upper and lower case, punctuation and numbers for all 3 sizes. An original antique circa 1920's Underwood Standard Portable Typewriter with its original case. The typewriter is in excellent all original condition apparently always well cared for. A very nice condition example of this Underwood classic four bank manual typewriter. The top lifts off for easy access. Whenever Possible we get Provenance of the Item from is past owners. Item value will be. Nice set of antique scales complete with weights. WONDERFUL CONDITION WITH THE ORIGINAL HARDWARE AND RUBY GLASS PANELS…. YOU WILL NOT BE DISAPPOINTED AS WE PRESENT WEEKLY. WE DO NOT PUT LOWER VALUES ON CUSTOM FORMS. WE SPECIALIZE IN LIQUIDATING LARGE COLLECTIONS! Vintage Kelsey & Co. Excelsior 5x8 Printing Press. Model D. Priority Mail Shipping Insured. The rubber on the roller is dried out and it will need to be replaced. Everything appears to move freely as it should. These have sold for over $1000.00 after being refurbished that would involve replacing the rubber roller cleaning it up and painting it. That makes this a really good value at the price I am selling it for. It is quite heavy that is why the shipping is what it is but I have seen some ship for over $120.00 If the insured shipping to your location plus the packing materials comes out cheaper I will refund the difference once it is received by you. A rare and very desirable, ca1887 Kyser & Rex Cast Iron, “Security Safe”, Bank Floor Safe form Still Bank and a fantastic addition to any Collection! 4 1/2" tall and 3 1/4” by 2” at the base. It is made in the form of a Floor Safe and features a single dial, brass combination lock (we have, as yet, been unable to “crack” the combination but will continue to try). 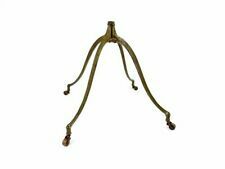 For Sale is a very nice, antique hat stretcher, block or milliners tool.It is in very good shape for its age and made of very heavy wood. All screws look original and are large plat heads. I have not polished it. Antique Vintage Industrial Mickey Mouse Disney Balloon Mold. A little over 6 1/2” tall and 2 1/8” wide. I was told this is from a closed factory in Ohio. Shipped with USPS First Class Package. The Adix is a column adder with a 3-digit readout. When you finish the first column, you write down the result, zero the adder, and start on the next column. The Adix is a beautiful thing to look at, and displays its inner workings proudly. Letters, numbers, symbols in various sizes. The mahogany stain finish is worn but the box is in otherwise very good condition. Up for sale is this very cool rack of 9 copper doll mold arms. ONE OF THE MOST ATTRACTIVE HAT FORMS WE HAVE SEEN…. THE MOLD ALONE IS 10” TALL….10 1/4” X 11 1/4" WIDE…. THE HARDWARE ON THE STRAP IS MARKED “WB & S” WITHIN A BULL TRADEMARK…. ALSO MARKED STAINLESS STEEL…. STANDS 12" TALL. DON'T FORGET TO SUPERSIZE THE PHOTOS FOR YOUR VIEWING PLEASURE. I BELEIVE IN AND PRACTICE THE GOLDEN RULE. "DO UNTO OTHERS AS YOU WOULD HAVE THEM DO UNTO YOU". Fits: ANY Koken barber chair w/ two hole opening. New Manufactured Headrest. Best of all, there is NO RESERVE. Have you been looking for thatpenny scale for your rec room or man cave?. This is an outstanding original scale that is a cool mint green (factory porcelain) that has great graphics, and appears to be all original. 2 1/4" high, 2" wide and 1/4" thick. It has 10 springs and on screw with a screw to put it in either up or down. This a great piece of history that I have not seen one like this one.This was made in Alliance, Ohio. 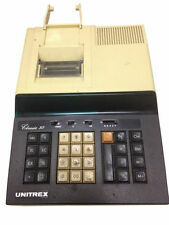 The Victor Model 110 was the first adding machine Victor produced for sale, in 1919. If you entered an incorrect number, you could push the “Clear” button and the keys would pop back up. Hint: to release the repeat button, pull it towards you slightly. This set contains a wooden jewelry display case and a removable velvet pad. Accessories not included. Antique Expandable cup with case. In very condition. Brim width is 3". Made of Maple wood. Constructed out of one single piece of solid maple. Covered box with a lock which works. Box is 5 1/4" by 6" by 1 1/2" high. Easel on the back of the adding machine works and the numbers turn. Made by Automatic Adding Machine Mfrs. Many familiar shapes and styles listed individually. This produced light bulbs at a rate of one million bulbs in 24 hours. Buy It Now at full price. If this is a rare, unique, highly sought after, "HOT" item and you don't want to lose out, your best choice is to. The least costly is not always the first one up. Buy It Now at the full price. Antique Platform Fairbanks Feed Scale 1000 lbs capacity. Keep things vintage country-cute with Turquoise Distressed Metal Kitchen Scale! This decorative piece has the look of an antique kitchen scale with brown distressing and a cream and black dial. This nonfunctional decor piece is the perfect accent for your farmhouse kitchen! Dimensions: Length: 8 1/2" Width: 8 1/2" Height: 7 3/4"
One piece is adjustable when the center handle is turned and is marked with a 7. You can find us at antique shows, flea markets and doing appraisals all over the Mid-Atlantic region. It's as simple as that. Fits: ANY Theo A Kochs, Emil J Paidar, Takara Belmont, & other barber chair w/ wide slot opening. New Manufactured Headrest. The Centigraph is a column adder that was patented by Arthur E. Shattuck. The patent was applied for in 1880 but not granted until 1891. The Centigraph is interesting for many reasons. First of all, it is quite beautiful. Antique Brass Gram Scale Complete Vintage Complete with gram weights. "Mercantile" is a term that describes anything related to commercial business, trade, or commerce. As such, mercantile antiques comprise a wide range of business-related products, including old retail packaging, cash registers, display cases, scales, office equipment, and furniture. How Can You Start a Collection of Mercantile Antiques? Mercantile antiques represent a wide variety of objects, so choose a theme or a particular scope for the collection, such as antique typewriters or retail ledgers. Consider the available space you have for storage and how much you can invest in maintenance. Collecting barber chairs or cash registers may appeal to you, but they can be large and bulky, and they require frequent cleaning and regular maintenance to preserve their condition. Many collectors choose to focus on small objects that are easy to display on shelves, such as retail boxes and tins. Larger objects, such as cabinets, can double as functional items, but collectors must treat them with care. How Can You Preserve the Condition of Antique Objects and Furniture? Over time, antiques build up a natural patina that is part of their charm and character. Preserve this natural aging on wooden furniture by applying good quality beeswax with a soft, lint-free cloth, rubbing in the direction of the wood's grain. The wax protects and brings out the color and grain pattern. Applying wax once every other month is enough to protect the wood, but in between those times, regular dusting keeps the item clean and encourages the formation of a hard wax skin. Never use metal cleaners on brass products, and in most cases, it is better to leave the metal as it is. For upholstery, regular cleaning with a vacuum cleaner removes dust and bugs that harm the fabric. After cleaning, collectors should position objects in the room so that they are out of direct sunlight, which causes fading, and in an area that is not subject to damp or rapid changes in temperature.